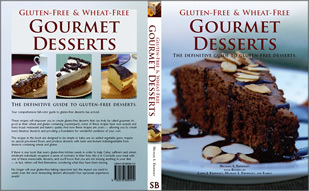 SureTalent Books is the branding under which Michael L. Eberhart has published his gluten-free recipes and cookbook(s). All copyrights and trademarks belong to their respective owners. All other content here is Copyright © Michael Eberhart, 2006-2018, All Rights Reserved. While all attempts have been made to verify information provided on this web site, the author and publisher (Michael Eberhart), hereinafter referred to as "PUBLISHER", assumes no responsibility for errors, inaccuracies, or omissions. All information is provided as-is. This site is not intended for use as a source of health, diet, legal, accounting, or any other advice. Furthermore, The PUBLISHER assumes no responsibility or liability whatsoever on the behalf of any reader of these materials. The reader of this site's content assumes responsibility for the use of these materials and information. Adherence to all applicable laws and regulations, federal, state, and local, governing professional licensing, business practice, advertising, and all other aspects of doing business in the United States or any other jurisdiction is the sole responsibility of the reader. We can not be responsible for the content of any linked material or any of the information that is displayed as a result of aggregated and/or collected information retrieved from external sources (e.g., news and blog articles). For permission to reproduce or use the materials on this web site, please contact us. Although any recipes we provide should be Celiac-safe and completely gluten-free, we have no control over where you get your ingredients, and which sources/brands of individual ingredients are used in your baking. Thus we cannot guarantee that the end product you create will be gluten-free. If you have been diagnosed with Celiac Disease, you should already be following the diet your physician has prescribed and be exercising caution and care by selecting certified gluten-free foods and ingredients. Many large commercial product brands now indicate gluten-free status on their websites. All persons should seek proper medical advice before introducing any ingredients into their diet that they may be allergic to. Do not bake for others without them knowing what ingredients are in the products you feed them. You should avoid recipes that contain raw or lightly cooked eggs if you are pregnant or in a vulnerable health group. Very young children should not be fed products containing peanuts and honey. Consult a medical professional prior to consumption if you have any concerns. We do not accept any responsibility for anything resulting from our recipes, the products produced by following our recipes, or the preparation thereof (aside from great taste)! Always exercise caution when baking, especially with power equipment and stoves. Even when recipes call for adding ingredients with mixer running, do so only if you are properly trained in such processes. Handle hot pans, sharp equipment, and the like with care, taking proper precautions to avoid burns and cuts. Allow baked goods to cool to a safe temperature before consuming or handling so as not to inflict burns. We provide no warranty, express or implied with regards to the suitability of the recipes in regards to your diet and health. Our limit of liability shall not exceed the purchase price of our book in any case. We will not disclose your contact information to any third-parties! We realize the importance of maintaining privacy when it comes to your contact information. Furthermore, we do not even currently maintain any contact information since our e-book sales are all handled by Amazon.com and their electronic books sales platform.